Different ways of saying sorry? I noticed that a search term that’s leading people to my blog – ‘how to say sorry with body language‘. Why not just ‘how to say sorry? There is a suggestion – in this phrase – that saying ‘sorry with body language’ is different to ‘saying sorry with words’. Arguably this is perpetuated by the common body language myth that non-verbal signals are more important than words. It’s not true. The ‘words account for 7% of all communications’ myth is based on a distortion of the original research. So before considering the links between words and body language, let’s consider one of the most famous apologies in history. Saying ‘sorry’ has a lot of benefits. Recognizing that you’ve made a mistake and quickly apologize for it can have the effect of boosting trust. People often use the phrase ‘that it takes guts to say sorry’. Apologizing can preserve and boost our self-esteem and our standing in the eyes of others, so it’s important to get it right. If you doubt this the recall one of the most famous apologies in history. Consider the unsuccessful ‘Bay of Pigs’ Invasion of Cuba by the USA in 1961. To put it mildly, the whole incident embarrassed the Kennedy administration. However, following the Bay of Pigs fiasco President Kennedy’s approval ratings increased substantially, leading to his comment ‘I hope I don’t have to keep doing stupid things like that to remain popular’. There have been many public apologies by celebrities over a range of misdemeanors. As a rule the most successful apologies are where people appear genuine. A sign of this is that is a match between verbal and non-verbal aspects of the message. I say ‘appear genuine’ because we have no way of really knowing if someone is being genuine. Mostly it’s gut reaction. It’s only after the fact that ‘body language experts’ point out what everyone sensed anyway. How to know if someone is genuinely sorry? We do not need any special training to detect deceit. We process the ‘message’ both at a conscious level but also at a ‘gut reaction’ level. A mismatch between the verbal and non-verbal aspect of the messages triggers alarm signals that ‘something is not quite right. So, trying to emphasize an apology with the supposedly ‘right’ body language may end up backfiring, even if we are genuine. Disingenuousness will ‘leak out’. The best approach is to focus on the apology and letting the body language ‘take care of itself’. If you are being open then your body language will match. You will be using open gestures. You will also be taking a ‘one-down’ position. It’s not an apology if you’re towering over someone waving your hands and spit out the words or if you don’t make eye contact and have your arms folded and mumble. Open hands, palms up, nothing to hide! The first step is recognizing what you are apologizing for. Clearly identifying the behaviours that ‘wronged’ the other party is the first step. Next is to communicate that you understand how the other person felt. It’s basic empathy, that is, to ‘put yourself in the other person’s shoes’. Including reference to how the other person’s feelings gives further indication that you understand the repercussions. It’s possible that the ‘injured party’ might want to fill in a bit more detail. Let them. Listen. You may wish to add a reason but don’t make lots of excuses. Keep it short. Planning an apology offers you the opportunity to think about what really is important. When choosing the words, don’t think it needs to sound like a piece of Shakespeare. It can be short and simple. When people want to appear to apologize but still retain the upper hand they have a tendency to ‘play with words’. In one my first jobs there was a supervisor who seemed to be constantly on a quest for one-upmanship. Instead of saying ‘I agree’ he would say ‘I wouldn’t disagree with you’. Phrases like ‘I’m sorry you feel that way’ or ‘I’m sorry you have interpreted my words that way’ are not true apologies. Finally be prepared that the other person may not accept your apology. However, if it’s heartfelt and you’ve tried your best then give the other person some time to process it. It may take a while. It doesn’t mean that you have to keep apologizing for the rest of your life. Sometimes people have a greater need to hold on to the hurt rather than move on. Sometimes an apology is not enough. For some people an apology will never be enough. That’s their right and their responsibility and that doesn’t mean that you have to take responsibility for it. Be genuine, make your apology, learn from your mistakes and then move on. Celebrity Body Language: Fact or Flim-Flam? Magazines seem to be filled with paparazzi shots of celebrity couples with captions and comments from body language ‘experts’ and speculating who’s in love, who’s out of love, who’s breaking up and who’s faking it. With such amazingly specific analysis, it’s easy to fall into the trap of thinking that it all actually means something and we are getting hot celebrity gossip before the news even breaks. It doesn’t and we aren’t. For every stand-out expert ‘hit’ we remember, there are countless ‘misses’ we forget. The body language experts with psychological training know that they are not educating or communicating anything psychologically meaningful but rather just there to entertain.Those without a background in psychology will just make it up as they go along in the hope that if they repeat something often enough it will become true. Ultimately the sound byte caption over the pap snap gives us no insight to celebrity relationships but speaks volumes of our obsession with other people’s lives. Get out your own holiday snaps and inspect them. Do your red eyes mean you are possessed by the devil? Do you closed eyes mean you are actually sleep walking? If you’re caught in a few snaps with your hands covering mouth does it mean you are an habitual liar or trying to wipe ketchup from your chin or simply that you don’t want your picture taken? So despite the talk of hand positions, finger and positions, the authenticity of smiles, it actually means very little. It’s just gossip with a bit of psycho-spin to give it an air of credibility. But credible it is not. One of the most important things we ‘know’ about body language is not true! It’s based on a distortion of research by Albert Mehrabian. Body language does not account for 55% of the message in all communication. This figure is only relevant The 55% figure is only relevant when we are forming an attitude (like or dislike) of someone. The fact that some ‘experts’ incorrectly trumpet this blatant misreading of the research (intentionally or through ignorance) simply distorts our perception of the importance of body language over words, and over context in the case of pap snaps. It really means very little in celebrity snap shots and would have to be so obvious that we wouldn’t need an expert to decode it, such as one person strangling the other. Yes, it offers an example of a particular body language sign but to say it actually applies in a particular case (such as a photo) is at best guess work and most likely flim-flam! It’s there to entertain and titillate not to inform or educate! Setting aside the fact that psychologist shouldn’t be speculating about the private lives of celebrities, body language (non-verbal communication) isn’t as exact as the ‘experts’ would have us believe. Context and congruence are all important. One ‘classic’ signal may conflict or be overridden by other signals. A snapshot cannot possibly provide all the information necessary to make an educated guess let alone a definite statement. We need to take a video approach over the snapshot approach. To gain any insight into the state of a relationship the signals we need to consider a broad range of signs and behaviours over a longer period of time, rather than cherry pick based on a snap shot. It’s worth remembering that a turd with a cherry on the top is still crap! Things to do instead of obsessing over body language. Following on from my post about the 55% – 38% – 7% body language myth, it strikes me that if the myth was true – that words only account for 7% of any communication – why both learning different languages? It’s true that many people travel to far off lands and instead of learning the lingo, just speak more slowly, more loudly, add an ‘O’ at the end of words, and gesticulate furiously. However, does this mean any bewildered local person gets 93% of the meaning? Of course not! Instead they can be 93% sure that the traveller was too damn lazy to buy a phrase book! Now, imagine going to a lecture in a foreign language. Would you be able to discern 93% of the technical information from the speaker’s tone of voice and hand gestures? Afterwards, perhaps you could rent a foreign language DVD and switch off the subtitles and enjoy all the subtleties of the story. And why aren’t mime artists the most highly paid people in the world? After all, they must be the best communicators. Why didn’t President Obama give his inaugural ‘speech’ through the medium of dance? In each of these scenarios it’s obvious that the words account for much more that the often reported 7% of communication. For if words are so unimportant, then we do we both to continue to use them? Why don’t we just grunt and point? And how do ‘body language experts’ communicate the relative importance of words to body language? Do they ‘moon walk’ or communicate through the parlour game of charades? Goodness know they should for the sense they make, but no: they use words! And, it’s clear that what is at fault is the inability of some so-called ‘body language experts’ to put the proper value on words and actually read the bloody research they cite! Perhaps they were paying too much attention to the rustle of the pages or the book cover instead of giving due prominence to the printed word. When we actually read the research by Albert Mehrabian that gave us he 55-38-7% rule we learn that body language and tone of voice have prominence over words only when we are forming an attitude about another person, that is, deciding whether or not we like them. It’s that specific. It’s certainly no antidote to the ‘Tower of Babel’ language divide. Although, the statistics are often quoted out of context to falsely inflate the importance of body language in everyday communication, the research has important implications for first impressions. When plucking up courage to speak to someone it’s important to know that people pay less attention to what we say but more to the general impression we make. So, we don’t have to say something super-intelligent or offer a witty one liner or a cheesy chat up line. In the initial stages, it’s a smile that makes all the difference. Once you’ve ‘broken the ice’, words become more important. Even more important is that we learn to listen to them. 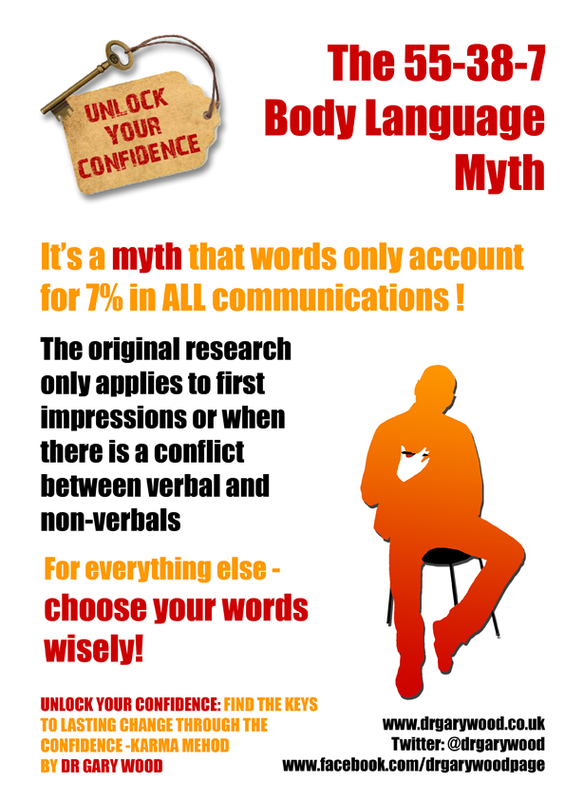 Body Language Myth: The 7% – 38% – 55% Rule. 55% refers to the importance of body language/face. That’s amazing. Except that it’s not true. This is not what the original research by Albert Mehrabian concluded. It doesn’t relate to any type of communication. It is context specific. These figures mainly relate to a situation where we are forming an attitude (like or dislike) of someone. So the words could still be the most important part of the message. The body language and tone of voice are what we mainly use to assess whether we like the person delivering the message. The other situation where non-verbal communication seems to have priority is where there is a conflict between the words and non-verbal stuff. If communication lacks congruence, we are more like to disbelief the words. None of this is the same as saying ‘in any communication’. Often, in research, the context is everything!